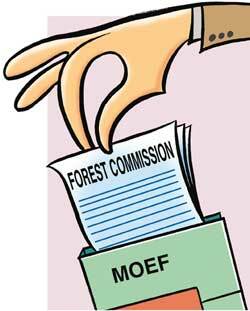 The forest commission submitted its report to the Union ministry of environment and forests (moef), recently. But many observers had anticipated the document's tenor well before the report was submitted, after the commission sent a note to the prime minister's office in March contending that the proposed forests rights bill would be inimical to conservation and forestry. The contents of this note did not remain hidden from conservationists and tribal rights' groups. Many feared that the commission's report would mirror the moef's stand on forest rights and other issues. Their fears weren't unfounded. Set up in January 2002, the forest commission's tenure marked an eventful period for the moef: the tiger crisis leading to a questioning of old shibboleths, while the move to open forestry to private entrepreneurs placed the moef's working under the scanner. But the report seems untouched by this tumult. Let's understand why. The first chapter puts forward just two recommendations. The first is a call to increase the forest cover to 33 per cent of the country's land area. There is nothing new about this recommendation: the government has been harping on it since 1988. The second proposal is a call to classify forests better, which can be done. But the research acumen in institutes like Forest Survey of India lie unused because of a lack of political will. Who in the ministry would want to tell how much forest is natural and how much is mere plantation. Banalities abound in the next two chapters as well. It's only in the fourth chapter where the report betrays its true intent. It recommends powers for divisional forest officers to summarily remove encroachments. It also demands a change in the Indian Forest Act, 1927, with greater powers for the forest department. How this is received is a funcion of one's position in the debate about forest dwellers' rights vis-a-vis conservation, but the fact is that the report has put in words something that moef has been contemplating for more than a year. The chapter on ecological security sets the government some demanding tasks. Control livestock movements across state boundaries, it directs, and then asks the animal husbandry departments to 'relate' livestock numbers to existing 'natural fodder'. One cannot but miss the irony here: the commission does not even spare a passing thought on increasing the productivity of our degraded forestlands for the sake of pastoralists and livestock-bearing villagers, but it wishes that forests become more productive and available to industry. The report's tone is much like that of a ranger or forest guard: the villagers have to do their bit for conservation if they want their meagre rights over usufructs (after due deductions of departmental costs). Sample this: " jfm (joint forest management) is a social contract and...rights would only accrue if the people fulfill their... duties." And this as well: "Villagers may provide inputs for...forestry operations through their labour. This...will lead to a low-cost model of jfm". Amidst these perorations, there is nothing on how the forest department has made a travesty of jfm's original intentions: it's now more of a cash cow for the department, rather than a community-driven programme. Hatch a wild plan Wildlife conservation does not get a better deal from the commission either. The report demands "dereservation of inhabited areas from protected areas... be done after the areas chosen to be added to the protected area (pa) system in lieu of those dereservations, are... notified as pas." Only 'trouble-free' areas should be brought under the pa system and the ones with people should be left out, the report recommends. This, as any forest officer will admit, strictly off the record, is a pipedream: historically India does not have wildlife preserves resembling the pristine sanctuaries of the developed world. In India, humans inhabit forests. Each inch of forestland is fought over and turned productive, even if in a minimal manner. The suggestion rebels against the logic of why there has been such a clamour for rationalisation of pa boundaries. Most of the report's 360 recommendations lack innovation (at times logic too) but they are the terms by which the forest department intends to govern forests in the coming years. If one needs any more proof of the report's bankruptcy, talk to Chandi Prasad Bhatt, the legendry Chipko movement leader and a member of the commission, who has written a dissenting note against the spirit and content of the report. His arguments should suffice as a warning against its adoption.